Pai Somsak Boonkam was born in the rural village of Roiet, Northeastern Thailand. His parents were poor rice farmers who believed in education. When he was eight, they sent him to an uncle, so he could go to high school. He studied his way through the university and became an engineer. At 18 years old, he came back to his hometown, but found that all his friends had left the village too. Like in most rural areas of Thailand, there were no job opportunities in Roiet. Many of Boonkam’s friends had moved to the cities hoping for a better life. Once there, they were faced with many difficulties. It was hard for them to adapt to urban life, and they would only get the low-paying jobs. Meanwhile, with no one to enliven it, the community’s culture was dying. Boonkam wondered what he could do, but he had no idea. He went on with his own life, took a sabbatical and traveled to India, Laos and Myanmar. He then moved to the US, to pursue an MBA in sustainability. Finally, he came back to Thailand and was hired by the Mae Fah Luang Foundation. 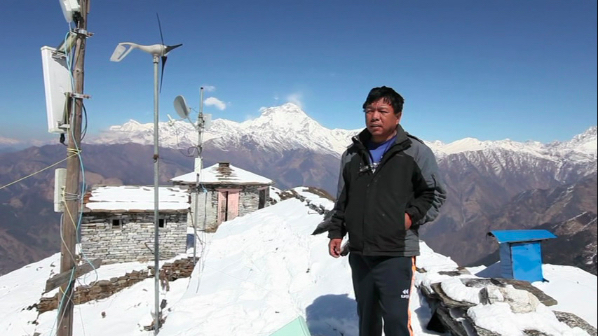 His job was to manage a rural homestay project in the Northern part of the country. This is when he got the idea to use tourism as a development tool. For the villagers, this was a great annoyance, for which they hardly received anything. Hotel chains and tour operators get 70 percent of the income generated by tourism. Less than 10 percent goes to the communities and hill tribes who still live in poverty. No wonder some are tempted to sell their traditional treasures to the tourists. Boonkam believes there is another way to travel. He also believes that tourism can sustain the development of the communities. That’s why in 2012, he quit his job to start Local Alike. He was 31 at the time, and his ambition was to make the Thai tourism industry more just. And to do so, he would work with the communities to create authentic tourist activities. Each tour promoted by Local Alike is designed by the villagers themselves. They decide everything – from the concept to the pricing. Even the guides are local people. Boonkam and his team give some support, making sure that the tourists’ expectations are met. 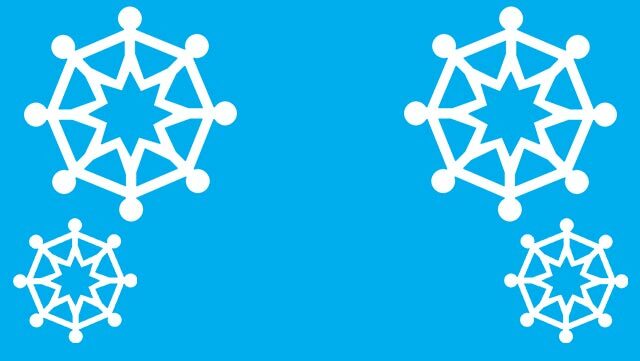 What’s more, Local Alike connects the local communities with their clients. They promote each project on their website, where the tourists can do their bookings. 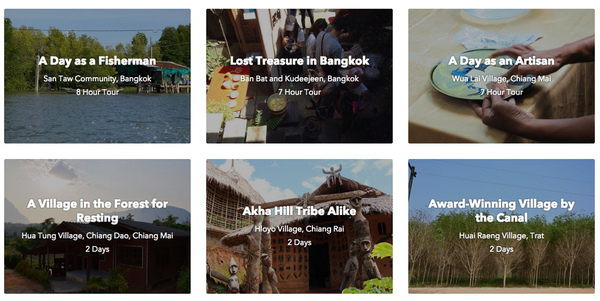 In three years, Local Alike has developed tourism projects in 15 communities across Thailand. And everyone is already reaping the benefits! Travelers can now delve into the local communities’ real life. So far, 1,300 tourists have participated in a tour or an activity. For the communities, it means 20 percent of extra income every year. And more than 2,000 jobs have been created. Moreover, a dedicated development fund is formed for every participating village. Local Alike gives five percent of its profits and the community gives five percent of its income. The money is then used to finance local projects. And it’s paid off, like in Suan Pa, north of Thailand. This hill tribe village was the first one to work with Local Alike. It is a hidden gem, yet it had a bad reputation among tourists. The locals would not pay any attention to the waste. Boonkam spent time explaining to them how important cleanliness was for the tourists. Right after, the villagers gathered to clean the whole place and its beautiful surroundings. Soon, trekkers came back, bringing hope of a brighter future. Viral hepatitis is the main cause of liver infection worldwide. In Pakistan outbreaks are frequent, and 7.4 percent of the population is infected with Hepatitis A and E. Many live in rural regions where there is no clean water and sanitation. In 2014, the Umrana Mumtaz Healthcare Trust decided it was time to tackle the issue, and this is a good news for the most disadvantaged! One night in 2003, Mrs Umrana Mumtaz had a dream. She was dying from cancer, and yet, she dreamed of opening a small healthcare facility in rural Pakistan. She told her dream to her husband Ali. And since they had some money left despite her medical treatment, he swore to have her dream come true. At the time, Mumtaz was working for the Ministry of Commerce and he had no experience in healthcare. But he is a man of action and he had been doing some social work for a long time. He decided to build a two-story hospital in the rural outskirts of Mardan in Northwest Pakistan. In the region, there were only two public hospitals, and they were located in the urban district. Most patients had to walk several hours to get treatment, whose quality was very poor. As a result, the local maternal mortality rate was high. Soon the UM Healthcare Hospital would welcome a hundred patients a day. For the doctors, it was overwhelming, as they had to treat an incredible variety of diseases. However well qualified they were, they did not have the required knowledge to treat them all. Mumtaz thought ICTs could solve this issue. So he turned to his son Atif, who at the time had already started a few high-tech companies. 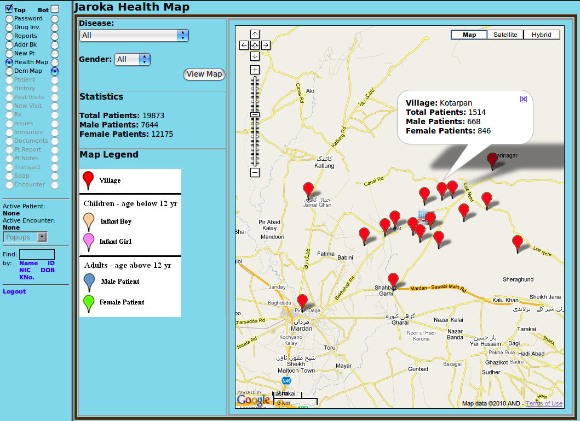 With Stanford University, Atif developed Jaroka Tele-healthcare, the first telemedicine solution in Pakistan. Whenever the doctors faced a complex case, they could seek for advice from qualified specialists all around the world. 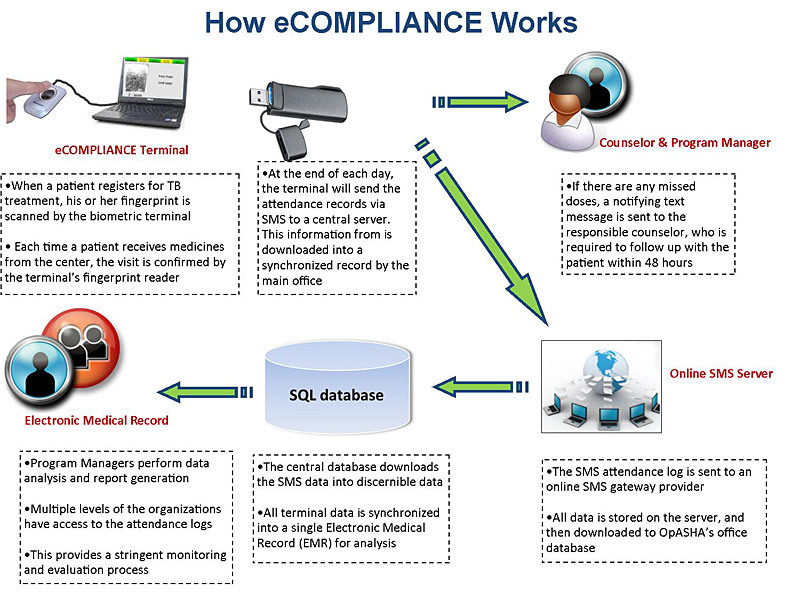 They would email them the patient’s electronic medical record as well as the relevant photos and videos. This would allow the specialist to assess the situation and advise on the best procedures. For the patients, it meant they would get the best possible care, and the cost was minimal. Jaroka also allowed the doctors to circumvent the local conservative culture. In the region of Madran it is considered shameful for a woman to see a male doctor. Well aware of the situation, Ali Mumtaz had hired a female physician, but she had to step down, leaving the job to the two male medical practitioners. So women became reluctant to come; they would also refuse to undress. Of course, this made examinations quite difficult. This conservative culture is widespread in Pakistan. This is why in 1994 Prime Minister Benazir Bhutto launched the Lady Health Workers (LHWs) program. The goal was to ensure women have access to primary healthcare services. Today there are 110,000 LHWs across Pakistan, and over 70 percent of Pakistani rely on them for their medical needs. Ali Mumtaz decided to use the Jaroka platform to connect the local LHWs with the doctors at the UM Healthcare Hospital. They distributed mobile phones to those operating in the region of Madran. When they had a doubt or did not know how to treat a patient, they would easily contact the doctors, so they could give them advice. 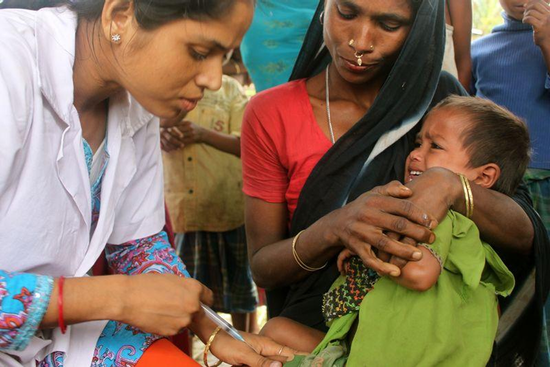 Today 53 percent of the UM Healthcare Hospital’s patients are treated by Lady Health Workers using Jaroka. In only one decade, the dream of Mrs Umrana Mumtaz has come true, probably beyond her own expectations. Overall the UM Healthcare Hospital has provided medical treatment to over 200,000 patients, 90 percent of whom live beyond the poverty line. More recently, it has been tackling another critical public health issue: the prevalence of viral hepatitis in the region of Madran. For instance, at the UM Healthcare Hospital more than 20 percent of the patients suffer from Hepatitis A or E.
To try to eradicate the virus, Mumtaz and his team have been leveraging on the Jaroka setup. The Lady Health Workers raise awareness in the villages; they are also responsible for recording all the hepatitis cases they encounter. The data are then agglomerated in real time, allowing the UM Healthcare doctors to identify and prevent imminent outbreaks. And since early detection is the key to complete recovery, it means that they are saving a lot of lives! Can a Mobile App Foster a New Green Revolution in India? For the past decades, the share of agriculture in the Indian economy has kept shrinking. Even though the sector now accounts for 17.4 percent of the country’s GDP, it still employs 263 million people. That is, 22 percent of the Indian workforce. Since the Green Revolution in the 1960s, India’s production of food grain has increased fivefold. The country is now self-sufficient, but it is facing a major productivity issue. It is still far below that of China, Brazil, or the United States. India’s agricultural sector is fragmented. 78 percent of Indian farmers own less than 2 hectares of farmland. These small farms are often over-manned and quite unproductive. Irrigation facilities are inadequate. Only half of the land is irrigated, and many farmers are dependent on rainfall to grow their crops. This makes them vulnerable to climate-related risks. Modern agricultural practices have not yet been adopted by a majority of farmers. This is due to a low level of awareness, high implementation costs, and impracticality in small farms. The government’s large agricultural subsidies also tend to hamper productivity-enhancing investments. Finally, many small farmers are uneducated and therefore risk-adverse. Even when they are exposed to the latest agricultural approaches and techniques, the majority won’t adopt them. Too often, they find them too risky and they would rather rely on traditions than try new farming practices. That way, they won’t maximize gains, but they believe they will minimize loss. Anand Babu C. and Shita Lotivakari are well-aware of the situation: their own parents were farmers. But after working for ten years for international companies, they also understand the potential of ICTs to improve the life of small farmers in the long run. In India mobile phone penetration is up to 90 percent. More than 900 million people have a mobile phone, and an increasing number is switching to smartphones. In the countryside in particular, the mobile revolution has already had a great impact. Rural Indians can more easily communicate with their relatives living in the cities, and they have an increased access to the outer world. For Anand and Shita, they can also play a major role in boosting agricultural productivity. In fact their dream is to leverage mobile technology to fill the information gap, which they think prevents farmers from improving their practices. That’s why the two entrepreneurs started Jayalaxmi Agro Tech in September 2014. Anand and Shita’s idea was to build on existing services. 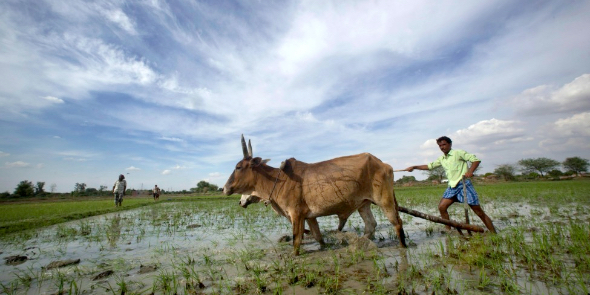 In India, several companies already provide weather forecasts and market prices to farmers. The problem is that they do it using text messages in English. Since most small farmers are illiterate, these services are not so much of a help. The two entrepreneurs thought through this illiteracy issue over and over, and they reached two conclusions. They agreed that using mobile phones to provide appropriate and timely crop-specific information is a great idea. But it is critical to develop easy-to-understand content; otherwise farmers will not use it. Anand and Shita boldly decided to go for a mobile application. This is, indeed, the most appropriate solution for farmers. With an app, they can offer them both audio and visual content in English and several regional languages. And everything is available offline. So far, Anand and Shita have developed 30 applications for agriculture, horticulture, and animal husbandry. Today Jayalaxmi Agro Tech’s applications provide information about specific crops (e.g., banana, pomegranate, potato, onion, etc.) as well as dairy farming and sheep rearing. Each of these apps aims at helping farmers to better manage their farm and boost their productivity. So what does happen when a farmer downloads the banana app on his smartphone? First, he gets information about the existing varieties. He learns where bananas should grow and how he should irrigate them. He also receives reminders on when to apply fertilizers. He is even taught how to control the diseases through a decision support system. The whole content is illustrated with pictures and descriptions in his mother tongue. So it is easy for him to understand and apply even complex notions. In only eight months, more than 50,000 farmers have uploaded Jayalaxmi Agro Tech’s apps onto their smartphones. And since all these applications promote sustainable practices, they may pave the way for a new agricultural revolution in India! How to Improve Education Quality in South Asia? 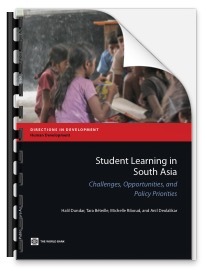 Last year, the World Bank published Student learning in South Asia : challenges, opportunities, and policy priorities report about the state of education in South Asia. It showed that, despite undeniable achievements, poor education quality is holding back the region and trapping the youth in poverty. The good news is: there are solutions! 1. 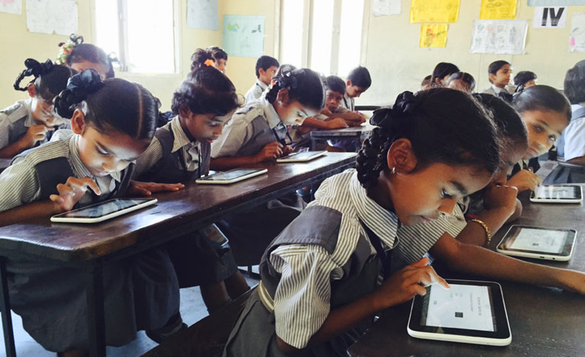 How is the education sector doing in South Asia? It’s doing much better! For the past decade, most countries have invested a lot in education, and they have achieved impressive results. Today, 89 percent of the children go to school; in 2001, there were only 75 percent. Besides, the literacy rate has skyrocketed, and 80.6 percent of the youth can now read. Yet, despite this tremendous progress, there is still much to do. Even now, 13 million young South Asians have no access to education at all. For those attending primary school, many will drop out before graduating, and only 58 percent will get a secondary degree. This is below the world’s average by 12 percentage points. 2. Will South Asia reach universal primary education by end-2015? There are still wide disparities across the region, so it depends on which country we are talking about. For instance, Sri Lanka achieved this goal several decades ago, and India with its 96 percent enrollment rate is well advanced too. On the contrary, Pakistan is lagging much behind, with only 72.1 percent of its children going to school. And in Afghanistan, the situation is even worse! 3. What are the barriers to accessing education? As elsewhere in the world, poverty and gender discrimination are the number 1 barriers. South Asia is one of the poorest regions in the world, and this has a huge impact on education. Children from disadvantaged families tend to drop out more often. But, here, the poverty factor is aggravated by the many conflicts and natural disasters that have racked the region since 2000. Schools have been closed or destroyed, and this has prevented the youth from studying at all. For the girls, the chance to get an education is even lower. Over half of them have to drop out before reaching the last grade of primary school. This is a pity, as educating the girls is one of the keys to overcoming poverty. Indeed, an educated woman is likely to marry at a later age and have fewer, healthier, and better educated children. And since they often get a higher wage, they can contribute to increasing the standard of living of their family. 4. What about learning outcomes? For the World Bank, this is the greatest challenge South Asia is facing now. The current education system does not give the youth the skills they need to reach their potential, get a good job, and succeed in life. Today, up to one-third of primary school’s students lack basic numeracy and literary skills. And it hardly gets better in secondary schools. This low learning outcome has not only an impact on the children’s personal development. It also undermines the whole region’s competitiveness, economic growth, and any efforts to reduce poverty. 5. Why is the quality of education so poor? Clearly, the educational methods are not effective. In South Asia, pupils are asked to rote learn rather than to reason or think for themselves. This is not to say that rote learning is useless. Still, children also need to be taught how to be analytical, solve problems, and write meaningful sentences. But how could it be otherwise? Teachers have insufficient skills and are hardly trained. What is more, a majority skips class one day in five, and this has pervasive consequences. In general, the teachers’ knowledge and commitment are critical to the students’ learning. But in South Asia, this is even more important. Most children are the first ones in their family to ever go to school, and they cannot rely on their parents to help them. 6. What could these countries do? For the World Bank, the priority is to invest in early childhood nutrition. It may sound irrelevant, and yet, the impact on learning outcomes would be massive, as malnutrition damages the children’s ability to learn. Another priority is to improve the teachers’ effectiveness. Governments should appoint them based on merit, train them, and reward their performances. This could increase the motivation of the good ones and persuade them to keep teaching. Surprisingly the World Bank does not mention them in its report, and yet, ICTs provide incredibly useful tools to educators. There are many examples of successful initiatives. For instance, Shilpa Sayura in Sri Lanka, Deaf Reach in Pakistan, and eVidyaloka in India have helped thousands of rural, disadvantaged, and disabled children break the learning barriers and overcome school failure. All these projects have proven to be both innovative and efficient, with few resources. So, why not take inspiration from them? This story started forty years ago. In 1975, young Michael Geary caught meningitis. He survived the disease, but lost his hearing for ever. The toddler’s parents were social workers in Manila, Philippines. “Because of Michael’s handicap we started working with deaf children to learn to help him,” explained his father Richard. With his wife, he launched a “small informal club for deaf teenagers, which we called Deaf Reach.” As it soon became popular, the Gearys started offering sign language education. In 1989, though, the Gearys had to leave the country for administrative reasons. “We went to visit a friend who was living in Karachi.” As they could not renew their visas to India, they decided to settle in Pakistan and start the Deaf Reach program one more time. Hearing disorders are a major public health issue in Pakistan. Today, 5 percent of the population has some form of hearing loss; and 1.5 million children are profoundly deaf. For these youngsters, life is tough. Too often, their parents believe they are cursed or mentally retarded. And because the majority do not know how to use sign language, they cannot communicate with their kids as much as they should. In this context, it is not surprising that many hearing impaired children only develop basic language ability. Even the 10,000 deaf students lack communication skills, as the schools do not adapt to their special needs. Sadly, these learning impediments have lifelong consequences, and most of these children will not be able to reach their full potential. That’s why, in 1989, the Gearys started by helping the deaf youth to gain life skills and get a job. One day, though, the couple was donated “two rooms in a building.” It encouraged them to open a small classroom. “We taught 15 primary-level deaf children, including Michael, from the slum areas of Karachi, said Richard. That grew slowly until we started a formal school in Karachi in 2007.” Since then, the Gearys have opened five other schools and empowered 1,200 deaf students, many of whom come from poor families. One of the problems the Gearys have encountered is the scant educational materials for the deaf. The current Pakistani sign language covers daily life activities, but many academic words have no sign-equivalent. To rectify this major issue, the Gearys took an ambitious, but judicious step. They decided to enrich the Pakistan sign language (PSL) by creating new signs in both the academic and professional fields. That’s how they started working on a PSL Visual Dictionary. They have already referenced or elaborated 5,000 words, but they thrive to include at least 10,000 terms in the lexicon. And since the dictionary consists of online videos, it makes the learning process easier and more effective. Indeed, each word is signed by an actor, illustrated by a picture, and translated into English and Urdu. Of course, the PSL dictionary is designed to support the deaf in their studies, but it also enables their parents to finally learn how to sign and better communicate with their children. But the Gearys are particularly proud of having contributed to enhance the employability of their students. Of course, many graduates become teachers in the Deaf Reach Schools, and they are among the best ones. But a fair number — 400 in 2013 — have found a job in a private company. In Karachi, five alumni run a KFC restaurant; others work as cooks at the Sheraton Hotel. Even a clothing design company, Artistic Milliners, has recruited 20 students. These are a few success stories, but they all show that the Gearys have been right all these years. The deaf can not only integrate the labor market; they can also make a positive contribution to the community!